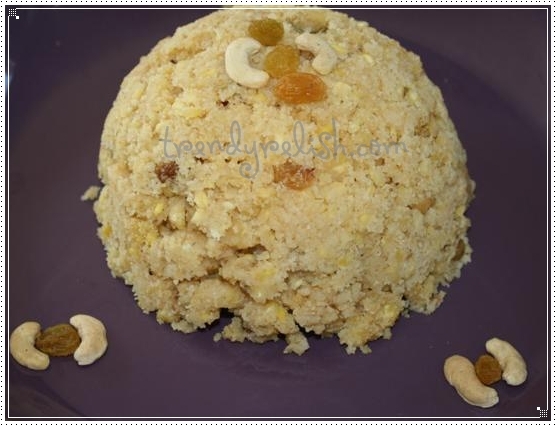 I made this yummy sweet pongali for this Sankranthi. I also made Soya Bean Vadalu which I will share in my next post. Wash and pressure cook moong dal until cooked. Meanwhile dry roast semolina until it turns golden brown in color. Keep aside. Heat ghee and add cashews + raisins and sauté well. Also add cardamom and mix well. Then pour milk + water and bring to a boil. Before it comes to a boil add sugar and mix well. When the milk boils add moong dal, mix well and finally add semolina. Add it slowly and mix well so that no lumps are formed. Keep the flame on low and allow the semolina mixture becomes thick and cooked. That’s all! Great tasting Rava Pongali is ready!! Looks yummy, tempting and fabuloous. Wonderful presentation. Excellent twist to usual pongal,loving it. good post ..... really helpful...!! Delicious and fulfilling Pongal. Excellent preparation. 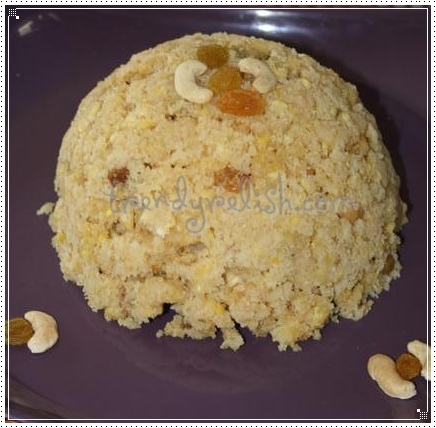 new to me, looks very delicious n yummy..
Sweet pongal with rawa , oh that sounds quick and tasty! Delicious pongali,looks so inviting n sounds so tasty. Pongali looks yummy, delicious and mouth watering.